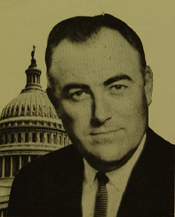 CLAUSEN, Donald Holst, a Representative from California; born in Ferndale, Humboldt County, Calif., April 27, 1923; graduated from elementary and high schools of Ferndale; attended San Jose (Calif.) State College; California Polytechnic, San Luis Obispo, Calif.; Weber College, Ogden, Utah; and St. Marys (Calif.) College; took V-5 Program, United States Navy; engaged in the insurance business, Clausen Associates, and in the air ambulance service, Clausen Flying Service, both in Crescent City, Calif.; served as a carrier pilot in the Asiatic-Pacific Theater, 1944-1945; member, board of supervisors, Del Norte County, Calif., 1955-1962; elected as a Republican to the Eighty-eighth Congress to fill the vacancy caused by the death of United States Representative Clement W. Miller (who had been elected posthumously), and to the nine succeeding Congresses (January 22, 1963-January 3, 1983); unsuccessful candidate for reelection to the Ninety-eighth Congress in 1982; director, special programs, Federal Aviation Administration, 1983-1990; died on February 7, 2015, in Fortuna, Calif.
Ralph Nader Congress Project. Citizens Look at Congress: Don H. Clausen, Republican Representative from California. Washington, D.C.: Grossman Publishers, 1972.